The Roxy Theater is located on Main Street in the heart of downtown Morton. 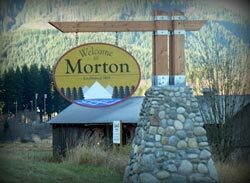 Morton is situated at the intersection of US Highway 12 and State Route 7 in the Cascade foothills along the White Pass Scenic Byway. It is located just thirty scenic miles from the year-round Nisqually Entrance to Mt. Rainier National Park. From US Highway 12, turn north onto State Route 7 / 2nd Street and continue .4 miles onto Main Street / State Route 508. The theater is located on the left side of the street.